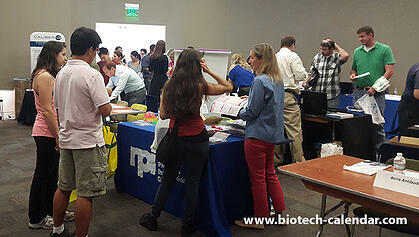 Researchers discover new products at the 2014 BioResearch Product Faire™ event in Austin. The BioResearch Product Faire™ event at the University of Texas, Austin is a great opportunity for everyone involved in the research process to find new products and technologies that will benefit their work and fill their lab with necessary new equipment. Along with discovering new products, all researchers who attend will have access to a complimentary lunch buffett of delicious foods, ranging from bagels and cream cheese with coffee and tea in the morning to fruits, veggies, sandwiches, pizza, and lemonade in the afternoon. Food is available from the beginning to the end of the event so there is no rush to be one of the first people to arrive to make sure you get a slice. If free food isn't an enticing enough reason to attend, there are also door prizes and giveaways at the event. One of the most popular giveaways are the Biotechnology Calendar Science Ninja T-shirts, which can be seen on our Instagram page. Researchers like to come year after year to collect shirts in different colors to proudly wear around campus. Other door prizes will also be available, and some lab suppliers might even have a few goodies to give away. You never know! The 4th annual BioResearch Product Faire™ in 2014 brought out nearly 200 active researchers. Last year, attendees came from 19 different research department from the University of Texas, Austins, making the event a great place to interact with other researchers as well. Since the University of Texas, Austin is such a large school, this event is a great opportunity to interact with other researchers to make new connections and find out what different departments have been working on. What better environment is there than one with free food, new supplies and hundreds of colleagues? Admitance is free for all researchers and lab personnel! You can either register the day of the event at the door, or register online in advance to save yourself time at the door.